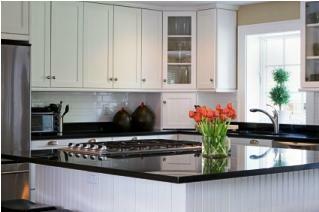 There are many factors that can affect the price of granite countertops. Understanding them can help you find a counter that fits your budget and your kitchen. Granite is quarried from all over the world. Large blocks of stone are cut from the earth and shipped around the globe to stone cutting facilities. Since extracting the stone can vary in difficulty depending on how far inside the earth it is located, and how brittle the stone is, the cost of the granite counter can start to be determined at its source. The cost of gas is on the rise, and with it rises the cost of transporting the heavy blocks of stone. Container ships are used to move the stone over the oceans; these ships are powered by gasoline and oil and the price of the granite counters rises and falls with the cost of the transportation. The number of facilities that have their hands on the stone greatly affects its price. If the stone is quarried in one spot, cut in another and fabricated in a third, the stone will cost more than if it is quarried and cut or cut and fabricated in one source. There is an enormous range of price in granite countertops. With stone counters starting at $25 a square foot installed, and ranging to $400 a square foot for only the stone, there can be a lot of room in the middle. If you've found a granite that you love, but the cost is out of your budget, consider the following. Do you have a kitchen island, or a bar area? Considering using the higher priced granite in these smaller areas and using a lower priced granite for the rest of the kitchen. Since higher priced granites tend to be showier in color and vein, you can create a dramatic look in the kitchen for less this way. While Azul Macuba may run $300 to $400 a square foot, it's also an extremely prized and rare material. If you can swing the cost, consider the fact that your kitchen has just become one of the most unique showplaces in your area. Remember that the price of stone can vary depending on its source, sometimes as much as hundreds of dollars. Shop around and do some cost comparisons; you may find the same stone somewhere else for less. The cost of your granite counter is also affected by your kitchen design. How many seams do you have? How many cutouts? What type of edge have you chosen? By keeping the kitchen design, and the details of your counter simple, you bring the cost down. Eliminate the 4-inch granite backsplash, and choose an eased edge to knock hundreds of dollars off your design. Do you have a small kitchen or a galley kitchen? Left over pieces of stone from larger jobs cost far less than a full slab. If you aren't choosy, or you're willing to have a seam or two, you can score a granite countertop for a small kitchen for a lot less per square foot by using remnants. Most stone yards have them; all you have to do is ask. While the price of granite countertops can range, rise and fall, remember that no matter what stone you choose, the natural beauty of granite is sure to enhance any kitchen. Whether you select a low cost stone with a quiet pattern, or a high end stone with flashy veins, you only pay for the stone once, but you'll enjoy it for years to come.